On Wednesday, September 28th, the TFW2005 family lost one of their own. 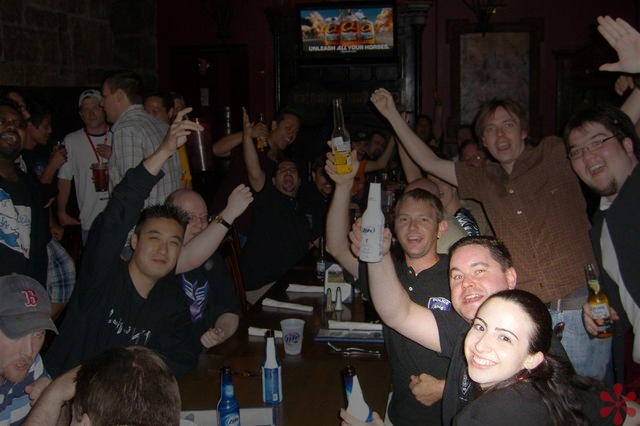 Gary Clark, aka Optimus_Scourge, a former moderator and former photo staff member of TFW2005.COM, as well as a current moderator on our sister site ToyArk.com, passed away suddenly at his home. He was 34 years old. He is survived by his wife and longtime TFW2005 member Luisa (“Arcee”), as well as his two sons. Gary had a passion for Transformers and G.I. Joe. The only thing that seemed to surpass it was his passion for helping his friends and others in the collector community. Gary was always ready to meet someone new with a smile on his face and share his passion of collecting with others. The news of his passing comes as a total shock for countless members who had not only spoken to him recently, but had seen him at the last New Jersey Collectors Convention (NJCC) in April, and had planned to see him again in the next couple of weeks at the next NJCC. Gary started as everyone does here at TFW2005 as a member. Over time he quickly gained the reputation of having a level-head, being incredibly friendly, and very out-going. Over the course of many years, he attended several BotCon conventions and became a close friend to many of us on staff. He became a moderator but his passion didn’t stop there, and he also became a member of our Photo Staff. Due to circumstances beyond his control, Gary scaled back his participation from the site but could never let go completely, and was currently an acting moderator at our sister site, TOYARK.COM. He participated in numerous Transformers-related podcasts over the last few years. Gary also met the love of his life on our forums, Luisa (“Arcee”), kindling their relationship at OTFCC 2004 and eventually getting married. To this day they hold the distinct title of being the first real-life love story to have happened thanks to TFW2005.COM. In these hard economic times the cost of putting to rest our loved ones can make things even more difficult than they already are. Gary’s widow Luisa (“Arcee”, a long time member of TFW2005) has set up a PayPal account for anyone willing to send donations to help cover the major expenses (totaling in excess of $10,000 just for funeral costs alone). TFW2005.COM is not directly connected to this PayPal account but supports the reason for its creation and supports the cause. Gary did not have any life insurance, thus all expenses must be paid out of pocket. To view the obituary for Gary Clark and to share your memories and pay respects through the funeral home, please click here. The entire staff of TFW2005.COM sends their sincerest respects and condolences to Luisa and Gary’s family. We invite all of our members and guests reading this to share any memories they have of Gary in the current discussion thread. While we mourn his passing, Gary will never truly be gone as long as we never forget him. Rest in Peace, Gary. And thank you for the memories. I've been away for quite awhile and I just found out about this terrible news when Arcee posted in the Philly meet-up thread just recently. My condolences to her, her sons, and the rest of the family. I did not have the honor of knowing him personally, but I did get to read many of his informative posts on TFW. As said by others, a passing by a member of the fandom is like a passing in the family. I'm So Sorry for your Loss , My Prayers and Thoughts will Be with you and you'r Family and Friends. It saddens me deeply to hear of your passing my friend. I pray for comfort for your family, friends and loved ones. You will not be forgotten Optimus Scourge! RIP Gary. I have an idea and Shane gave be a good idea as to how to pull it off but I'm wondering if there are other suggestions you guys can give me. I have to get an urn and to my knowledge I've never seen a transformer one. Gary has a vintage optimus prime cookie jar which we purchased from a fellow board member a few years ago. He LOVED this thing because he had one as a kid but it broke. So when he found another in perfect condition we didn't hesitate to get it. We never actually used it and had been sitting on a shelf in our bedroom ever since. I was thinking about turning it into an urn but it is ceramic and not as durable as an urn would normally be. It was suggested to place it in a clear box about the same size and fill with clear vinyl. This is a good option but it would be permanent and I could never open it again if I wanted to place items into the urn. As of right now I don't even know if the cookie jar is big enough. If it is not big enough can anyone put me in the direction of those people who made helmet and chest plates out of resin and fiber glass who were at njcc last time? I obviously don't know what goes into making something like that but considering I've seen the awesome things they have made I would imagine this shouldn't be too difficult to do. If it's the cookie jar I'm thinking it is, it should be plenty big enough. And it should be durable enough. You may consider placing Gary in a bag, and placing the bag then inside the cookie jar. That way, you can open it whenever you want. And if it DOES ever become damaged, you've got an "inner hull" so to speak. A StarWars buddy of mine did the same with an Ewok cookie jar – should work out the same. I don't know who among them MAKES the costumes, but I wager you'd find them here. And if you can't make NJCC one of us can get a business card from them or a phone # for you, I'm sure. didn't know ya personally, saw a bunch of your posts throughout the boards. Gary may you rest in peace, and never be forgotten. Arcee, may you and your family find the strength you need to make through these dark days and overcome the obstacles ahead. My thoughts and prayers go out you. He was a local guy, wish I could've met him. God Bless. My thanks.continue to all those who have supported me through this time. Yesterday was difficult but I managed. Special thanks to Shane, Curt, Sherry, and Nate who stayed by my side the whole time. I think the five of us stayed by him longer than anyone else. I could have stayed there all night if they would have let me. I'm hoping he is returned to me by the end of the week so I can have a memorial for him in philly for everyone who was not able to attend. Hi Luisa, It's Nate. I wasn't sure if you knew my TFW handle. As I said to you being there didn't require a second thought, and if you need anything else you know were just a phone call away. It was indeed a beautiful service. Just difficult to get through. Gary rest in peace bud. The staff over at TFsource were very saddened today to hear about Gary's passing. Gary was one of our original TFsource customers that over the years always sent lots of friendly emails. I fondly remember his emails, and positive personality…often writing to check on or update his order and along with it just chat about life in general, give us an update on how things were going with him, and make sure everything was OK over at TFsource. I also remember years back at Botcon he came up just glad to finally meet me in person and shake hands. A better guy couldn't be had, so it's really a sad day for several of the staff over at TFsource to read this update, who over the years have communicated with and gotten to know Gary well on a more personal level. We will be sure to post, and let us know what TFsource can do to help. Gary supported us over the years and it's the least we can do to pay it forward and help out when his family is in need. I'm terribly sorry for your loss Arcee. I won't know what he passed away from until the official report is done in three to four weeks. Sadly I won't get him back in time for njcc. I don't even know if i'll be home in time for njcc. I really wanted to have everyone together but I may have to wait til the next njcc. I wish I had another week until the convention. I have so many things still to do. I like many, never had the pleasure of meeting him, but I understand the pain of loosing a loved one, and my heart goes out to his whole family. He lived a warrior……………and left a legacy. Let his spark join the Matrix, the Greatest of Cybertron. Honey, no thanks needed that's what friends are for. If you need us call us. So young and unexpected. I will keep his soul and his family in my prayers during this horrible time. I hope I'm not stepping over any boundaries when asking this. Was Gary in the service and passed overseas protecting his nation? How do you really ask someone, all the while being sensative, as to how their loved one passed? He died suddenly at home. I asked the same question since he was so young. If the family doesn't want the public to know, I respect their wishes. Sorry to hear this. Condolences to the friends and family. I didn't know him personally, but it is still sad nonetheless.